For related articles and more information, please visit OCA's Health Issues page, Appetite For a Change page, and our Food Safety Research Center page. Why are some states simply ignoring the latest studies, and passing new laws that will hurt your teeth and harm your health? Action Alert! Water fluoridation was introduced to the United States in the 1940s as a way to use waste product from the manufacture of aluminum, a waste product that was expensive to dispose of and which was harming cattle and farmland. Since then, the federal government has taken the stance that the fluoridation of drinking water, which conveniently disposed of the waste, is vitally important to help prevent tooth decay; the CDC called it one of the ten great public health achievements of the 20th century. 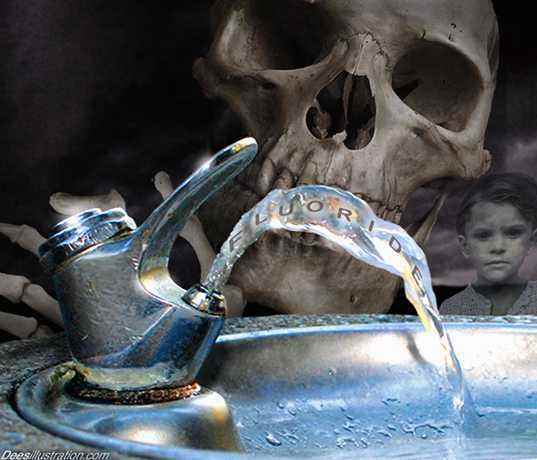 But the the latest scientific studies have finally made the US Department of Health and Human Services (HHS) and the US Environmental Protection Agency (EPA) change their tune on how much fluoride is safe. The data indicates that dental fluorosis-damage to the teeth from fluoride, ranging from lacy white markings or spots on the enamel to staining and pitting of the tooth surface-happens when fluoride levels are too high. Water is only one of several sources of fluoride. Other common sources include dental products such as toothpaste and mouth rinses, prescription fluoride supplements, fluoride applied by dental professionals, and exposure through our food, which is often sprayed with fluoride-based pesticides. Today the fluoride in your water mostly comes from the phosphate fertilizer industry-but it's still toxic waste, containing other byproducts such as arsenic, lead, cadmium, and mercury. And two studies show that fluoride increases the accumulation of lead in bone, teeth, and other calcium-rich tissues, transporting heavy metals into areas of your body they normally would not be able to go-like your brain.